Beocord VHS 80 was Bang & Olufsen's entry into the VHS arena. Both Beocord VHS 90 and VHS 80 had stereo sound circuitry with Dolby B Noise Reduction. So when combined with a stereo Beovision they ensured the fullest enjoyment from stereo videotapes. You could also record stereo TV/FM Simulcasts if you used a stereo Beovision model. One of the many plus points for owning a Bang & Olufsen VHS recorder from this period meant that for the first time, you could operate both the Beocord and the Beovision using the same remote Terminal. Whichever Beovision you chose, whether mono or stereo, Beocords VHS 80 or 90 would have been an ideal match for it. One touch on the TV's remote Terminal allowed you to play a videotape, make recordings, fast wind or rewind the tape, scan the tape in either direction or freeze a single frame on-screen. If you wished to combine a Beocord VHS 80 or VHS 90 with a non-Bang & Olufsen TV, the remote Video Terminal could be purchased separately to provide chairside control of all primary playing and recording functions. Beocord VHS 90 offered the best of both worlds - a high quality stereo sound recorder that, when connected to a hi-fi system, achieved performance characteristics that were close of compact discs; and a video recorder that combined superb picture quality with true hi-fi sound. When used as an audio recorder, up to 8 hours of music could be stored on one VHS tape and replayed non-stop. For hi-fi video recording, 4 hours was the maximum. With Beocord VHS 90, you could instruct the automatic timer to record up to five different programmes up to 14 days ahead. A repeat button enabled you to record the same show at a specific time every day of the week. 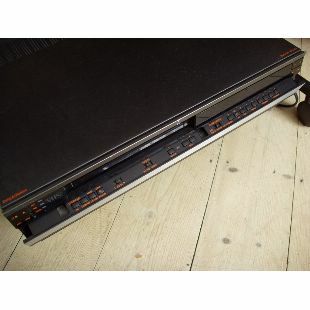 Unlike most most dual-purpose machines the Beocord VHS 90 records two versions of video track simultaneously: a hi-fi stereo track for replay on the same machine and an 'ordinary' stereo track which meant that your cassettes could be replayed on a non-hi-fi stereo video recorder. Beocord VHS 80 also had stereo sound circuitry for video recording and playback. In fact, it offered the same video facilities as Beocord VHS 90, including an identical 39 channel search-and-store tuner and 5 programme/14 day timer. Picture quality was of equally high standard too, but Beocord VHS 80 did not offer audio-only recording or hi-fi sound characteristics. However, it did incorporate a Dolby B Noise Reduction Circuit for maximising the recorded sound. Placement of both VCRs: a practical stand from Bang & Olufsen organised your video system into a complete remote-controlled centre which could easily and discreetly be placed in your viewing room.